Walter Forehand Jr., the unfailing bartender at the Hilton Garden Inn and former beach services director in Flagler Beach, was trauma-evacuated by air late Saturday night after a wreck on his motorcycle on U.S. 1. Tyler M. Tracy, a 21-year-old resident of Palm Coast and parent of a toddler, was killed his SUV lost control and overturned on U.S. 1 near County Road 304. The Florida Highway Patrol is seeking a witness. The man was traveling north on U.S. 1 in Korona, just south of the Old Dixie Highway intersection, when a maintenance pick-up truck pulled out of the service station and struck him. Shaklyia Chess was a 16-year-old junior at Flagler Palm Coast High School. She was driving south late Saturday night on US1 when she lost control of her car. 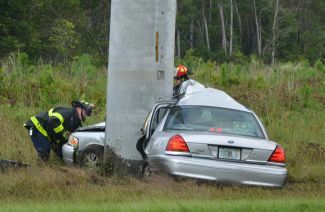 Jessica Vides, a 2005 FPC graduate, and–separately–Joseph Edward O’Guin and Cacilia Carter of Bunnell, were critically injured victims of the wrecks–one on US1 and CR13, one on Colbert Lane in Palm Coast. Josh Crews was 34 and had been a fixture behind Woody’s bar in Palm Coast and St. Augustine since 2005, and had once owned the restaurant with his brother Matt when it first opened in 1998.